Over the years, many misconceptions about SEO have appeared. Everyone can do SEO, if you're not getting immediate results then there's something wrong with your SEO strategy, SEO is a scam - do any of these sound familiar? These false comments can be very harmful to your current marketing strategies if you fall victim to them. Do you remember our popular blog post The Definitive List of SEO Myths? 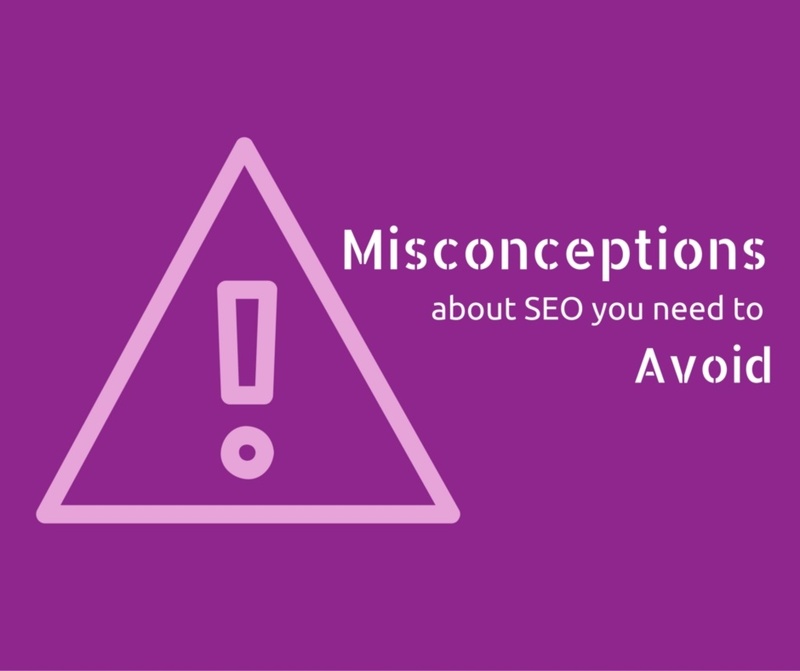 Now let's have a look at the most common misconceptions of SEO so you don't get taken down by the wrong facts. Search Engine Optimization is a long term strategy and because of the long wait for results to come in, it can be hard to measure. When you first start with SEO, you may be lucky and some of your keywords may achieve high rankings straight away whilst some may take at least six months before they budge. Some people don't realise SEO is a long process and give up after a few months. You have to be patient with SEO, cutting your strategy short means a loss of an investment on your side. "SEO costs a lot of money"
We've had clients in the past who are put off SEO because they think it's expensive. It's true, SEO can be expensive but it all depends on your business, your competition and your ambitions. If you're a small business owner who wants to improve your visibility online, the cost of SEO will be smaller compared to a large company hoping to get their business worldwide. The price of your SEO package can be shaped around what you want to achieve with your website, you have the control to make it as cheap or expensive as you like. If everyone was trained to do SEO, then yes they could do it themselves. However if your knowledge or practice is limited or non-existent you can unintentionally do more harm to a website. It can take a small user error to fatally damage your rankings. For your SEO strategy to work, you need to understand how search engines work. You need to follow the rules to avoid penalties that could de-index your site altogether. "SEO is all about buying links"
Buying links is bad, very bad. This is a dangerous misconception about SEO. People with limited experience of SEO think if they buy follow links to their site every month, their business will increase in ranking. Purchasing links to improve your website ranking is a violation against Google's Webmaster Guidelines. If an agency is purchasing links that's bad practice you want to keep your website far away from. "SEO is basically keyword stuffing"
This misconception can show a person's limited knowledge about SEO. Many years ago, before Google and other search engines started stamping down the rules, people presumed they could just stuff their website with relevant keywords. Today, Google will penalise your website if it's overstuffed with keywords. Depending on the length of your content you should only be using your chosen word 3-5 times in your content. "For SEO to work you need to choose keywords with high volumes"
When you decide to get SEO done on your website, you will look at which keywords you want to rank for. Naturally you want to choose keywords with high volumes of searches. But if you're a small fish competing against big fish using the same keywords then you aren't going to appear on the first few pages. You need to use words with smaller volumes and less competition so you can work to achieve top ranks for them. Why the misconceptions about SEO? Over the last few decades, myths and misconceptions have been growing about SEO. Because the effects of Search Engine Optimization can take a few months to kick-in, some people naturally feel SEO is a scam. You have to be patient with your SEO strategy. There are many components you need to consider to increase a website's visibility in a search engine. As more businesses are going online, there are more companies offering SEO services to help get their business found in search engines. It can be difficult to find which digital companies can be trusted and which can't. Because some people have had bad experiences with SEO companies or they don't know much about SEO, misconceptions have risen as a result. There are many digital marketing agencies offering SEO services, so you need to find a company who is considerate of what you want to achieve and can give you realistic goals. Every year more myths and more misconceptions about SEO appear, you need to be aware of them so you don't get taken away by them. Download our FREE list of SEO myths, so you can separate myths from the facts. What misconceptions have you witnessed about SEO? Tell us below.